Author Written by Janelle Swanson and last updated on Posted on October 28, 2017 . An SAP blanket purchase order is used for purchasing consumables or services from a vendor which can be repeatedly procured during a specific period of time. Consumables include office or shop items such as pens, stationery, nuts or screws and services like routine repair work and other maintenance. A limit is set on the blanket purchase order and multiple Invoices can be processed provided that the total of all the invoices does not exceed the overall limit. 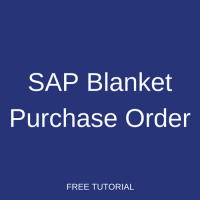 In this tutorial, as part of our free SAP MM training, we explore the creation of an SAP blanket purchase order. We walk through these components in the following sections. 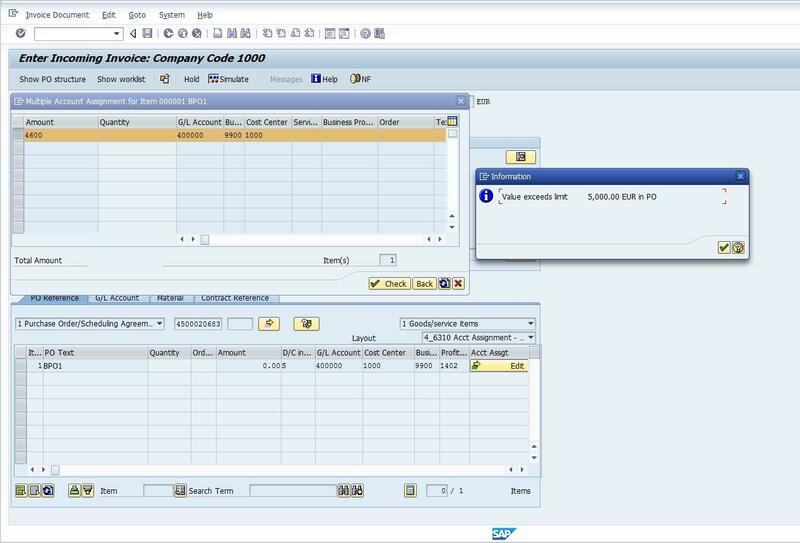 Create the SAP blanket purchase order via transaction code ME21N. Choose document type FO – Framework Order to categorize the order as a blanket purchase order. Every purchase order is assigned a document type to identify the purpose and functionality of the order. Enter the vendor master number in the Vendor field. For our example, we use vendor 9001 – Michaela Meier. Click the Additional Data tab in the header section and enter Validity Start and Validity End dates for the blanket purchase order. The validity dates provide the duration during which purchases can be made against the order. In our example, we set a one year validity period, starting on 09/26/2017 and ending on 09/26/2018. Select account assignment category K – Cost center to denote that a cost center should be specified and that all invoices should be charged to that cost center. The account assignment category list may contain standard and customized categories. Choose item category B – Limit. The item category of a purchase order identifies which type of procurement is taking place and triggers certain features. Item category B, for example, defaults a PO quantity of 1. This item category also switches off the goods receipt requirement for the blanket PO. Enter text for the item. Specify the plant for the procurement. In our example, we use plant 9001 – Berlin Distribution. Click the Account Assignment tab. 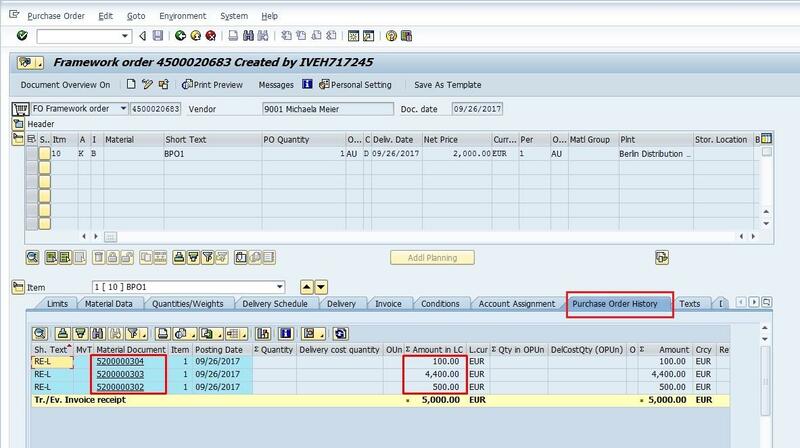 Based on the account assignment indicator K specified in the item section, specify the cost center and G/L account that all invoices should post to. In our example below, we specified cost center 1000 and G/L account 400000. Now that we have an SAP blanket purchase order, we can begin posting invoices straightaway. Remember that the item category B disables the goods receipt requirement. Post invoices referencing the PO number via transaction code MIRO. Since there is no GR for a Framework PO, how do you satisfy the traditional auditing requirement for a 3-way match? Blanket purchase orders are used for simplified procurement of consumable materials or services. This process has different auditing requirements compared to the traditional procurement process for stock materials. I realize that the auditing process would be different. Because SAP does not allow a GR on a Framework PO, I was looking for suggestions on how to explain that, how to “sell” the process in which the traditional 3-way match is no longer used, at least not technically. We are implementing ReadSoft and plan to use an “approval” workflow, and use the fact that the user approved it (which is recorded) in place of the traditional GR. You don’t need 3-way match if you procure things like consumables. They are relatively cheap and don’t even have individual material master records. If you don’t bother with creation of master records, then why should you use functionality like 3-way match? How do you receive materials if category “B” disables the MIGO transaction? what is the difference between using a framework order versus purchase order? which is better to use for a tolling operation?